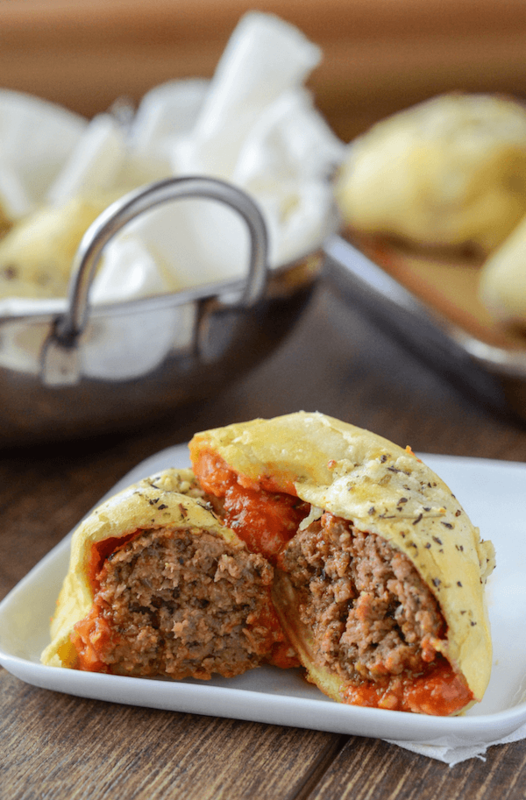 These Meatball Bombs are stuffed with marinara, meatball and cheese, then wrapped in dough and topped with a seasoned garlic butter. They are quick to make and have so much flavor! Spaghetti and Meatballs is one of our favorite weeknight meals around here. I buy my meatballs already prepared (not cooked, but seasoned and rolled into balls) already at Publix and it makes an amazing quick weeknight dinner that the whole family will eat! A lot of times we just eat the leftovers for lunch or turn them into a big meatball sub for Jorge, but I wanted to do something new with them. I thought of all those “bombs” that people make with pepperoni and I thought why the heck not try it with meatballs. BEST IDEA EVER. Jorge downed 4 of these in literally two minutes. And dare I say, they were so much better than the classic with pepperoni! They are really easy to make as you can see here. You just flatten out the canned biscuit dough and fill it with a meatball, sauce and cheese. Fold it up into a little ball and press down to seal the edges. Then top it with seasoned garlic butter and bake. I baked them on a silicone baking mat (ps if you get that one, it fits perfect in this big 18 x 13 jelly roll pan), because they might leak a little sauce and they can stick to a regular pan. If you don’t have a silicone mat, use parchment paper! 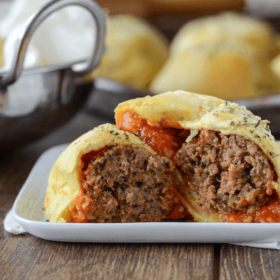 If you are looking for something to please the whole family – these Meatball Bombs are that something. They are a great way to repurpose leftover meatballs, but if you don’t have any leftover — you can always use frozen cooked meatballs instead! I can imagine these being perfect for a football party, an appetizer, or shoveling them in for lunch like we did. Either way, I know you are all going to love these! Note: If your meatball is a really large meatball, cut them in half when stuffing them in the dough. Make sure and seal the bottom (pinch the dough together) so they don’t open while baking. Place 1 meatball and 2 tablespoons marinara in center of each dough round. Top with 2 tablespoons of cheese. Wrap dough around meatball and cheese, pressing edges to seal. Place seam side down, leaving room for spreading on prepared baking sheet. Continue until all biscuits have been completed. In a small bowl, whisk together melted butter, garlic, Italian seasoning and salt. Evenly spoon on top of each biscuit. Bake for 18 to 20 minutes, or until golden brown. Serve warm! I have seen a lot of good meatball dishes but this one tops them! Love it! Made these last night and my entire family fell in love. Even my picky 10 yr old son has requested these once a week now ! Holy Delicious looking! Great job, those look incredible! My husband would devour these in a few seconds — they look awesome! Oh man these look good! Just the name alone has me drooling all over the place! Pinned! We love Spaghetti and Meatballs around here too but I bet we’re really going to love these meatball bombs!! What a fun way to eat meatballs – I love these! I could eat 27 of these bad boys!! Amazing!! Oh my … these look amazing and so creative! Okay, we must both have bombs on the brain. I just made something similar but with pepperoni and cheese. But meatballs? EVEN BETTER! I love the way your cooking mind thinks! These sound amazing. I can’t wait to bite into these delicious meatballs! One of my boys LOVES meatballs – I’m totally making these for him! Oh, my. PERFECTION. LOVE love love meatballs. This is what you call “the perfect dinner for the whole family!” Everyone would want to eat these. These look so fun! Love how easy the recipe seems too. I could absolutely knock these out for a weeknight dinner!! This is like a portable meatball, and I love it! Recipe looks amazing. However I have found it through Pinterest and many American recipies use incredients that cannot be found in New Zealand. Just wanting to know what home style butter biscuits are? What are the incredients to make it? Do you have any kind of canned refrigerated biscuits? If not, any buttermilk biscuit recipe will do! These look fantastic!! What a great idea by putting the meatball into the biscuit dough! We all love meatballs, especially my kids, so this will surely be a recipe that I’m going to try! Thank you! Have you ever made these and then froze them ? I have not. I am not sure how well they would hold up in the freezer. I was wondering the same thing about freezing. Do you think you could pre-bake and then freeze? I can’t find how to prepare and how long to bake them. Sounds really good even for an Italian.. I made these this wekeend and my husband and two daughters ate them all. No leftvoers. very good. I feel like I missed something here. What is this “dough” that they’re wrapped in? No instructions for a really important part of the dinner?!?! It’s canned biscuit dough. I used pre-made puff pastry because I couldn’t find biscuit dough where I live in Spain. That worked well too, and tasted delicious. I made them as well. I live in Spain at the moment, and I couldn’t find refrigerated biscuit dough, so I used puff pastry. I also had a little bit of leftover ricotta in the fridge from a different recipe, so I put a spoonful of that in each “bomb.” They were great! My boyfriend, our roommate, and I all loved them, and they’re super filling. We each had two, and we were absolutely stuffed. I had to cut my meatballs in half because I made my own meatballs and they were huge. But once I cut them in half, they worked perfectly in the biscuit. Thank you so much for the easy recipe. My husband said he likes these more than he likes them in spaghetti haha. We all loved them. The garlic butter put them right over the top. in a good way. Josie – can you share with me your meatball recipe? I’m looking for a good recipe. Thanks! Made these tonight to take to a friend., and for my family of course. Mine opened up in the oven, but they were still delicious! Josie, I feel like I missed something here. This “dough” where is that part of the recipe? I don’t see wbere it says what to use for it or how to make the garlic butter for them. Sorry but I’m one who follows a recipe to the T the 1st time. Thank you in advance. Jessica, I feel like I missed something here. This “dough” where is that part of the recipe? I don’t see wbere it says what to use for it or how to make the garlic butter for them. Sorry but I’m one who follows a recipe to the T the 1st time. Thank you in advance. I apologize! I JUST found the “Read more” button when I scrolled down. Just made these . Made enough for the week and some to take to work and share. Love them. I used the flaky dough and turkey meatballs. Had to cook them a few mins longer to be sure dough was fully cooked. I also used Parmesan herbs on top with olive oil. Will make more for sure. I’d post a pic if it let me. I did post pics on FB. Easy, fast, fun, tasty !!! So glad you liked these Milissa!! Glad to hear the flaky dough works just as well as the “butter tasting” ones. 😉 Thanks for taking the time to come back and comment on how they turned out! And you just reheat them in the microwave? ?? I can’t wait to try making these. They look yummy. I have a question though. Could you use canned pizza dough in place of the canned biscuits? Thanks. Probably, but canned biscuits rise a whole lot more than canned pizza dough. It might still work though! If you try it, make sure and come back and let us all know how it turns out! Used pizza dough and they were ahhhmazing!! I don’t care for the taste of canned biscuit dough, so I chose pizza dough and it was super yummy! Jessica,Thanks for sharing your absolutely delicious recipes. Can’t wait to try the meatball magic you created. I’m going to make these for my Bunco night this Wednesday. We all bring a dish and try to top one another. All in good fun! Bunco Babes love appetizers! I’ll have 8 opinions for you on Thursday! Do you meatballs need to be cooked first before puttin inside the dough? Yes, the meatballs should be cooked through before placing them in the dough! These look amazing! 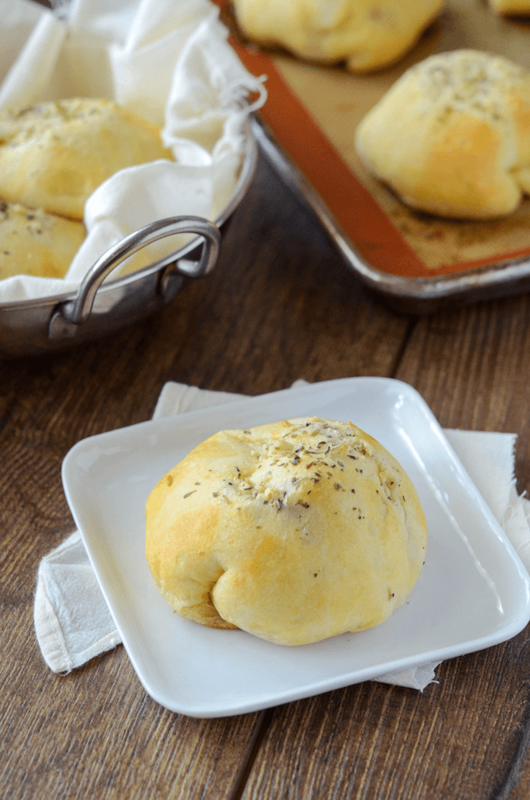 Will croissant rolls work with this recipe? I haven’t tried it with croissant dough to know for sure, but I think it would work. It would not be as fluffy as a biscuit though. A little late but my wife just showed me this. Yes they work great. I used the pillsbury croissants that come in a sheet. I got caught up when you said you use not cooked, prepared meatballs and went for similar instead of cooked like the recipe said. I had a hard time getting the meatball cooked inside the biscuit before they got to golden brown. If they had been made from burger we would have been fine but can’t serve undercooked ground pork meatballs! I will totally make these again but with cooked meatballs instead lol Awesome recipe and idea! Oh no! So sorry, yes the meatballs are cooked already! Glad you still enjoyed them! Do you have to use biscuit dough. Only thing I have is crescent roll dough. Do you think that could work? These do look really great! Could you tel me what size meatball you use? One inch? Two inch? Thanks! Sounds perfect! Glad to hear the croissant bread worked out great too! The recipe is posted at the bottom of the blog post, right above the comments. What is a good side to make with these?? Hi Katrina! 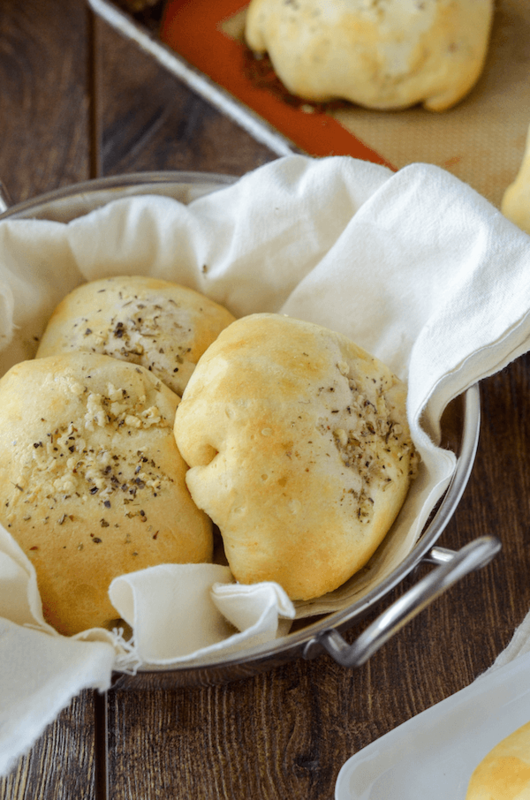 I usually serve these as an appetizer, so I don’t have a lot of ideas…but I do think they would go great with a big Italian salad on the side! I love these!!! I made them for 2 as a dinner served them with mashed potatoes and a side salad. very filling! So glad you enjoyed them Audrey! Thank you for taking the time to come back and comment how they turned out! I made these today and they are very good. Dough was perfect and I used turkey meatballs. Will try to get a little more sauce in mine next time but over all nice for lunch with salad. Making these tonight, made a pot of sauce and meatballs this morning. Will let everyone know! I made this recipe today. Very tasty. However, I rolled out the dough to a four inch round as directed and it was not large enough to hold all the ingredients. Most of it leaked out while I was trying to seal the edges. My finished product was the size of a 1/2 a sandwich. Next time I will try a different type of biscuit that will not rise as much and roll it out to maybe six inches. These turned out perfectly. Very delicious. These look great, just trying to think what I could use as a substitute for the 1 can (12 oz) Pillsbury Homestyle Butter Tastin’ refrigerated biscuits as we do not have that in Australia. Made these tonight…A hint for some of us! Put the cheese first and then the sauce and then the meatball. Lol. It was so much easier for me! This recipe looks great – I must try it. I’m from South Africa and we do not get the dough that you mentioned here. Do you think I could use a short crust pastry or a shop bought puff pastry and just add extra butter to the pastry. Which would work better? Meatballs are good. I like that bottom does not get soggy. I made these and they were awesome…in fact I just finished the leftovers for breakfast! I rolled the dough out larger than 4 inches so nothing would leak out as someone else posted. I used the remaining sauce for dipping. I will definately make again…and again!! Did you wrap the meatballs when they are frozen or do you let them thaw a bit before wrapping and putting in the oven? If using frozen meatballs, I would let the meatballs thaw first. If you have any “make your own meatball” recipes that I am somehow not finding, I’d love it! The frozen meatballs at my store are not my favorite! Thank you! If you are fixing these for dinner what is something you could serve with them to make a meal? I would serve a salad or some veggies like broccoli! Made using homemade sauce and meatballs sooooo good my kids loved them!!! It was soooo good. The whole family went crazy! Hi, thanks for sharing this delicious recipes, …great job! I’m having troubles with the bottoms cooking??? Seems the oil or butter is not letting the dough cook??? Made these tonight. Rescued the meatballs from a failed crockpot spaghetti and meatballs recipe. Husband is an Italian crockpot spaghetti was way too soggy. He refused to eat more than a couple of bites. He loved the meatball bombs as an appetizer. He also had a salad . I served him a pizza with the works. He was very happy. He Loved the meatball bombs! Made these, but family preferred to use the marinara as a dipping sauce instead of putting inside the dough with the meatballs and cheese. Still delicious though. I grew up hating meatballs. Just gross, yuck, blah. But…grew up, Moved to Florida, got to buy my own groceries and … Like you said the magic word for me PUBLIX meatballs OMG I can not wait to try your recipe with them. Thank you for sharing! Made these meat bombs tonight for dinner they were a big hit. My husband doesn’t like anything foo foo so I also made just plain meatballs. After I explained that the meat bombs weren’t just homemade rolls he decided to try one and really liked it. My daughter tried one then went back in the kitchen came back with 5 on her plate. So great recipe I made my meatballs from scratch I cooked them on the stove first and my oven cooks things pretty fast so it only took ten minutes in the oven. 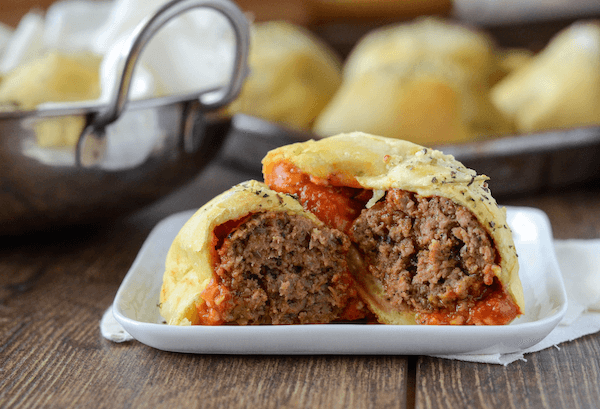 These meatball bombs just look so incredibly delicious and I am so craving a slice right now! Can I post it on my blog?